One of the most varied of creatures, amagnaes boast many colors and temperments. The lightest of them, a bird with beautiful silver and dark gray plumage, is considered one of the most dangerous. It will charge and snap with a sharp beak if anyone other than its magi approaches, and is not overly affectionate. By comparison, the other brown colored amagnaes seem docile, though they too are not friendly creatures and prefer solitude. They will occasionally mingle with the wild turkeys, whether to migrate or hunt for food, but the villagers had best not confuse the two. Their gorgeous plumage easily marks them apart, and if a human does make the nasty mistake of hunting one, they are in for a horrible surprise. Amagnaes are very intelligent birds, and they love to play elaborate pranks. They will hide, sometimes for hours, and when an unknowing farmer attempts to cut the head off of a future meal, it will spring into action and attack. Their beaks are cruelly sharp, as are their claws. They will happily pursue the poor human until bored, leaving them with deep scratches to tend to. Not surprisingly, this does not endear these animals to most humans. Nor does their magical power: that to move objects at will. These birds are only capable of this magic when extremely angry, and use it viciously. Rocks will rise into the air and fly at the victim, or tree branches will fall. Naturally, this makes most everyone move very slowly and carefully when around amagnae, so as not to enrage them. This light colored egg is covered with speckles. Though born small enough, amagnaes grow at alarming speeds, eating everything they see. Most of the day they can be seen in flocks, combing the fields for any seeds to consume. It is best to stay away from them when they are feeding, for they do so in flocks and are liable to attack any potential enemies. When alone, your amagnae is slightly more affectionate, sometimes forcing its way into your lap and demanding a petting. They will not stay for long, though, as it is important for amagnae hatchlings to practice hunting for food and flying. Though these irritable hatchlings cannot fly for a few weeks after their birth, they are able to jump great distances. This allows them to evade any predators and perch on high tree branches. Hatchlings will also nibble at any berries found there, or perhaps harass any passing squirrels. One particular game they enjoy is sitting and waiting for a magi to walk by, and then giving the human a nasty shock by flinging themselves at them. 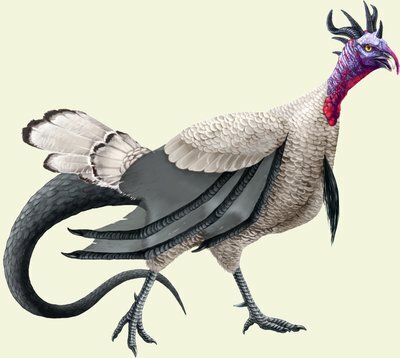 Amagnaes are easily one of the largest birds to roam the Silvan forest, which makes their skill at flying a little surprising. They can fly for days at a time, shedding much weight as they do so and crossing great distances. This is because they migrate as the seasons change, leaving the colder lands and returning to the warmth of The Keep. This time of the year also marks the harvest, when there is food aplenty and the amaganaes can regain weight lost. They do so by raiding the castle's gardens and the surrounding lands, making it necessary for many extra fields to be sown before their arrival. Though there are plenty of these birds to be seen in the fall, they recede to their nests in a few weeks and do not deign to occupy The Keep. Adults are capable of building very large nests, while hatchlings make smaller ones. These nests are guarded by adults at all times, and so do not need to be built high in treetops but are in plain view. It is a mark of high trust if an adult amagnae allows a magi to approach their nest, especially if it contains an egg. Amagnae eggs are all but impossible to obtain, and so are generally lifted from The Stream, where one can occasionally be seen floating along. This is by far the safer way to get an egg, but one cannot know which sort of amagnae is going to hatch: all amagnae eggs appear similar. It is not until they have hatched that one knows which kind of amagnae it is.